The model liked the Arsenal man as the best performer of the week with 10 expected points on 8 shots (4 SiB) and 6 CC. The "three elite forward" strategy which was en vogue for all of 2 weeks has been devastated by injuries to Aguero, Morata and Lukaku and so managers are now looking back to elite midfielders to lead their team and Sanchez is well placed to potentially fill that role. His incredibly low ownership number of just 3%, plus his earlier price fall make him an incredible opportunity to turn a profit if (or should we say when) his actual points haul starts matching his xP. 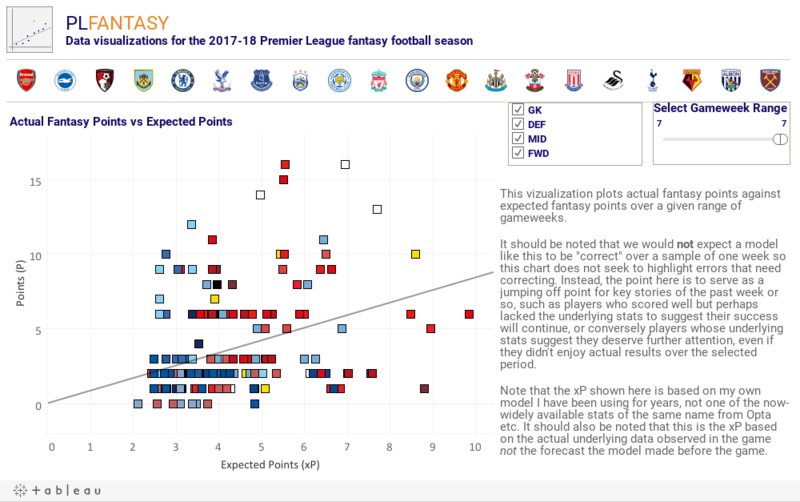 Arsenal's fixtures are good but not spectacular as they face City and Spurs in GW10 and 11 and the model doesn't think they're in the same league as City or their North London rival, but you have to also factor in that Sanchez will likely represent a huge share of Arsenal's SiB and CC and is about as locked into the team as one can be when healthy (the lack of Champions League involvement could be a rule boost there too). Fantasy squads are built as a whole, so looking at one or two individual spots in isolation isn't always useful, but if you'll permit a thought experiment, consider this. You need to fill two spots: a forward and a midfielder, and you currently have Lukaku at 11.6m and Silva at 8.4m (i.e. 20m). If you like Sanchez at 11.9m then who is the forward who balances the equation for 8.1m? Vardy is close enough in price to be doable, as is Firmino, and then you have the next group of the likes of Rashford and Welbeck (though you likely wouldn't want to go double Arsenal). This model isn't perfect of course, but, accepting it's limitations, and looking at that group you see players projected for somewhere around the 60 point mark, a full 20-30 points behind the elite forwards. That puts a lot of pressure of Sanchez to make up the difference given that the likes of Salah, Silva, Eriksen and Alli all bring a similar level of job security and are looking at points hauls of around 70 themselves. Based on the above - very rough - maths, Sanchez would need to be getting into Kane-level returns to justify his premium price above those other top midfielders and that's hard to project right now. Of course, you only have to go back to last season so see such a level of performance and if any midfield option can do it, it would surely be Sanchez, but I think the conclusion for now is that we need to see this week's performance level and maybe more over a couple of sustained weeks before he makes logical sense, although for those looking to gain ground on teams already, he offers a rare opportunity to own one of the best handful of players in the league without sharing his inevitable returns with everyone else. In some ways the elite players in the league can seem to cancel each other out, either because a huge portion of fantasy managers own them, or because they offer equally good value to another option who costs a similar price (see the recent Kane vs Lukaku vs Aguero vs Morata contest). Where you can make a sneaky difference is around the edges of your first team: players who need to play almost every week but need to come at a discount price. I'm not sure he's there yet but Shane Long's appearance in a prominent place on this week's chart highlights the Irishman's return to favour at Southampton and continues a decent run in Pellegrino's side. Over the past three gameweeks Long is tied with Aguero and Kane for the most touches in the opponent's box (22) and has racked up 7 SiB, just one behind Lacazette and Vardy and two behind the all conquering Kane. There is some concern around the quality of those shots but for what it's worth Understat ranked his xG for this week's game as 0.54, exactly the same as Kane against Huddersfield, so it seems at least some of the shots were quality. I still like Calvert-Lewin and Joselu's potential in the budget group but not one is doing a great deal to stand out right now which opens the door for someone like Long to get a look in if Southampton can get back on track in the next month which features games against NEW (H), WBA (H), BHA (A) and BUR (H). *After writing the above I now see that Long missed tonight's Ireland v Wales game, so obviously check his status if you did want to make a move. Not a great deal to say here, other than that it's amazing people aren't on the Brazilian yet. To date 90,000 managers have brought him in - which isn't nothing - but it's less than the 97,000 who have opted for his teammate Doucoure, who has exactly 3 SiB and 3 SoT on the season (albeit all of which have become goals). Richarlison meanwhile is 2nd among midfielders in touches in the opponent's box, total shots and SiB. Even his 10 CC isn't terrible for a mid-level player focused on scoring rather than setting up others (ahead of Salah and Mahrez and tied with Willian). Watford get Arsenal this week then face a tough trip to Chelsea so perhaps managers are wisely waiting until after that to pickup Richarlison but I urge you to keep him in mind at that point, even if he's kept quiet for those tricky games, as Watford then face only two really tough fixtures in the next 12. I have heard some talk that De Bruyne is widely considered to be the best player of the 2017-18 season as we approach the quarter-way mark. I am not particularly interested in debating that suggestion but I am interested in this kind of discussion's impact from a fantasy perspective. A player's overall ability is not a huge concern for fantasy purposes - other than I suppose the small impact on earning bonus points - but rather it's simply about racking up goals and assists. In terms of assists, there are few, if any, better placed that the young Belgian. He leads the league with 24 CC and with elite teammates getting on the end of them, not to mention a large chunk of them coming from set pieces, from which De Bruyne clearly excels, there is no arguing his assist potential is sky high. However, his teammate Silva trails him by just a single created chance and has notched six "big chances" created to De Bruyne's three, most likely due to the advanced areas behind the front two that Silva has been occupying of late. Either way though, let's call it a tie. The goal threat however is far from close. Silva has racked up 9 SiB with 3 "big chances" in the first 7 gameweeks, compared to just 2 SiB for De Bruyne and 0 big chances. Of course, the Belgian has 12 efforts from outside the box and will no doubt ripple the net a couple of times this year thanks to his quality, but history shows that SoB are converted at a low rate, even for a player of De Bruyne's quality. Consider that last season he converted 54 SoB in 4 goals (a 7% rate) and the season before that he notched 2 goals on 27 SoB (7%). This season he has a single goal from 12 SoB for, you an 8% conversion rate. This puts him on track for something like a 5 or 6 goal season if he plays every week. Now, the retort could be that Silva is yet to find the net at all, but give me the player who's shooting from inside the box will regularity and has averaged over 5 goals a season over the past three despite playing just an average of 26 games any day of the week. Factor in Silva's 1.5m lower price tag and I find it hard totify De Bruyne's 17% ownership. In fact, I could make a decent argument he's the 4th ranked City midfielder I would own, given the additional chances Sterling and Sane should get in the side with Aguero sidelined. Thank you for this important information! Unfortunately I still don't understand why green in my flag is bad. I think that IQ of a person depends on everyday routine and day-to-day development but not on exact marks. I've passed a special test at online academic writing service and my IQ was very high in comparison to average one.